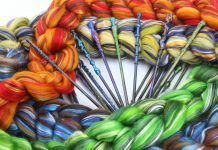 If you’re not a member of our monthly Fiber Subscription Box you can sign up today here and see past club boxes on our Ravelry Page. 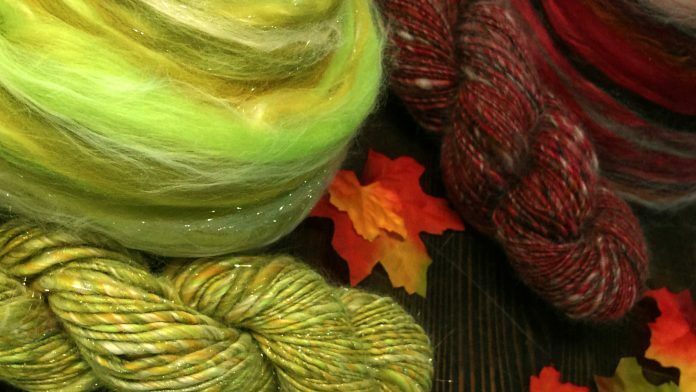 Before we dive into our exclusive blended tops I’d like to first go over some hand spinning glossary terms that are crucial to understanding the fiber you are spinning. Roving is a common term that is used to refer to any carded or combed fiber, this term doesn’t really give a clear sense of what the preparation of the fiber really is. The way your fiber is prepared is incredibly relevant to the entire hand spinning process. Staple – The length of individual fibers. Micron – An average measure of a fibers diameter as measured by a specialist. The lower the number the finer the fiber. Top – A continuous untwisted strand of manufactured wool that has been scoured,carded or combed. This process removes the shorter fibers and arranges the longer ones in an overlapping parallel alignment. Top is typically used for dense, smooth yarns spun with a short draft spinning method. Rolag – A tube of fiber created using hand cards or a blending board. Traditionally for woolen spinning, spun from one end. Puni – a tighter rolag traditionally used with cotton and other short stapled fibers. Batt – Created using a drum carder. 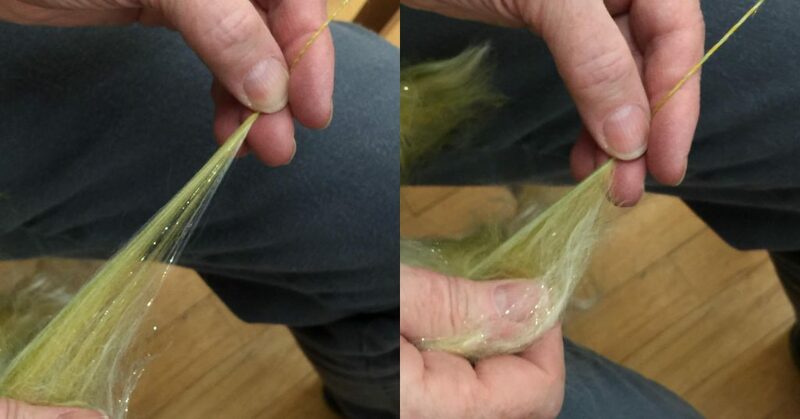 A sheet of fibers that are carded together. Roving – Carded Preparation. A continuous strand of parallel fibers that are pulled into a soft, slightly twisted, ‘rope’. Created from batts. Certain tools such as hackles and a Diz can be used to create as well. Sliver – A thinner, more loose, roughly parallel variant of a roving with less twist to the entire ‘rope’. Frequently interchangeable with roving. Pin-drafted – Several Slivers that have been drafted through a series of pins to produce a more aligned, open, and lofty roving. Primarily used for long fibers in the semi-worsted and worsted spinning systems. Blend – A preparation containing two or more different types of fibers or color and grades of the same fiber. Carding – The process used to open out fibers so that it can be more evenly spun into woolen yarn. In this process, the fibers are opened out into an even film. Can be achieved mechanically with Drum Carders or by use of hand tools such as Hand Carders. Combing – An operation in the worsted system of fiber preparation that removes short fibers (Noil and second Cuts) and foreign matter. The long fibers are straightened and laid parallel ideal for worsted spinning. Worsted – Refers to two different processes which are combined to produce a smooth, clean yarn. Originally this term referred to a woolen yarn manufactured in Worstead, Norfolk, England. 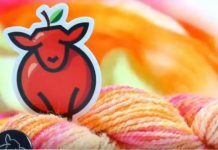 It now refers to yarn made of long fibers, combed, and tightly twisted in spinning. Fabrics made from worsted yarns are smooth and cool to wear. 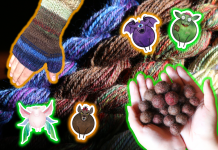 Worsted Fiber Preparation – Yarns spun when the fibers are markedly ‘paralleled’ as distinct from woolen yarns in which anything but a parallel position is noticeable. Traditionally, worsted yarns were from fibers 3+ inches in length, but this is no longer true as now many shorter and longer wool are also worsted spun. Worsted Spinning – The spinning process where the twist is not allowed into the drafting triangle. Usually plied and are finer and more tightly twisted than woolen yarns. Woolen – Yarns are made from shorter fibers of 1 to 3 inches, which stick out in all directions, giving the yarn it’s characteristic fuzziness. They are often singles yarns, and are thicker and more loosely twisted than worsted yarns. The outer layer of each yarn has a typical fuzzy appearance. The fabrics made from woolen yarns are warm and fuzzy. 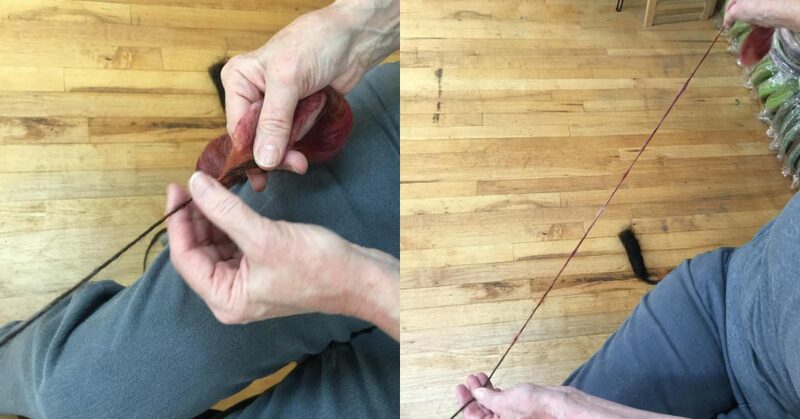 Spinning ‘From The Fold’ – Adds elasticity to long fibers. Sometimes referred to as ‘over the fold’. Helps easily manage mismatched fiber lengths, allowing you to use short or long draw. Offers extra control when varying lengths and fiber types are present. Used with fibers of 3-8 inches. Can be spun allowing twist into the triangle or not. Now that we have gone over various fiber preparations and hand spinning terms lets dive into the exclusive Blended Combed Tops we sent to our members this month. Tawny Port and Golden Lime- Inspired by Pantone Fall 2017 Colors of the Year. Tawny Port takes the Red family to new depths. This blend is elegant, sophisticated, and tasteful with an incredible hand and irresistible drape. Consisting of 35% Superfine 18.5 micron Merino Wool Top in the colors: Ruby & Rust. 25% Grade A. Mulberry Silk in the color Ruby. 25% Baby Alpaca Top in the Natural Shades: Grey & Black. 15% Brown De-Haired Cahmere Top. Golden Lime is earthy tones with a twist. With golden undertones, this yellow green shade is a refreshing complement to fall classics, with a lofty hand and astounding luster! 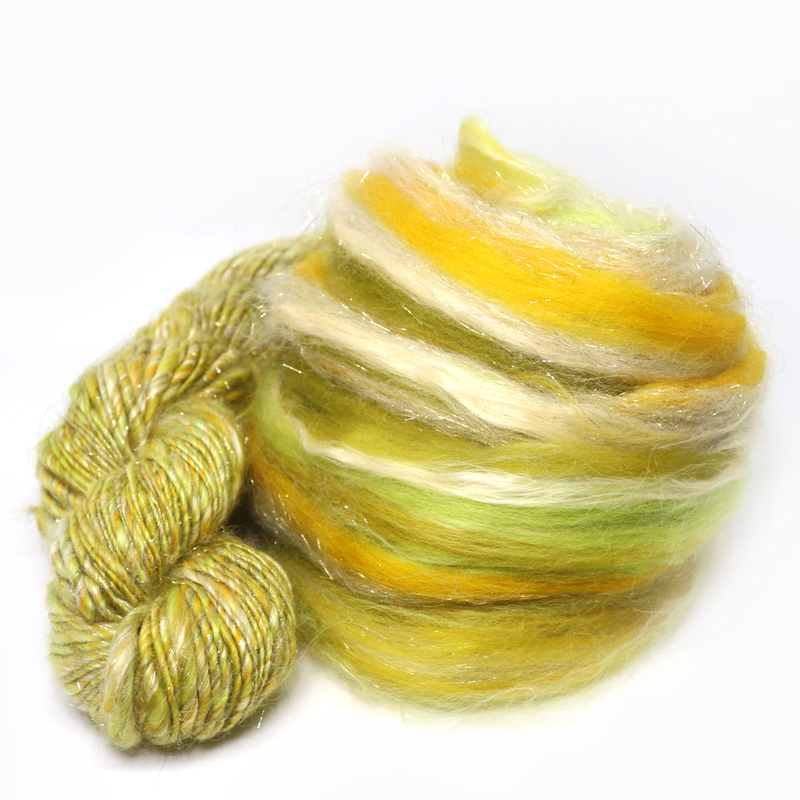 Consisting of 64% Superfine 18.5 micron Merino Wool Top in the colors: Pearl, Citrus, Mallard, and Lichen. 20% Natural Golden Soybean Cellulose Fiber. 10% Grade A. Mulberry Silk Undyed. 6% Golden Angelina Glitz. 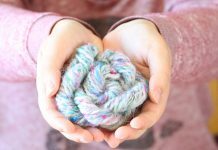 We encouraged our Fiber Club members during the Spring/Summer 2017 months by sending components to experiment with dyeing and blending to create unique and beautiful yarns. This month, we jump start your creativity by sending two specially designed blends to celebrate all things cozy and warm. There are many ways one can spin a blend. No matter which way you decide to turn your fiber into yarn, there is one sweet spot all techniques have in common, the drafting triangle. In the next section I will go over this sweet spot as well as a couple techniques I fall back on when spinning blended tops of varying staple lengths. The Drafting Triangle is a very important consideration when spinning. Drafting is the process of blending, leveling, and drawing out the fibers from your drafting hand to your spinning hand, where the fiber is separated and evened out before the twist is allowed to enter the yarn. The uniformity of the yarn is determined by the number of strands of fiber entering the drafting triangle. The volume of the twisted fiber resulting from the drafting triangle is what needs to be maintained to create a consistent yarn. 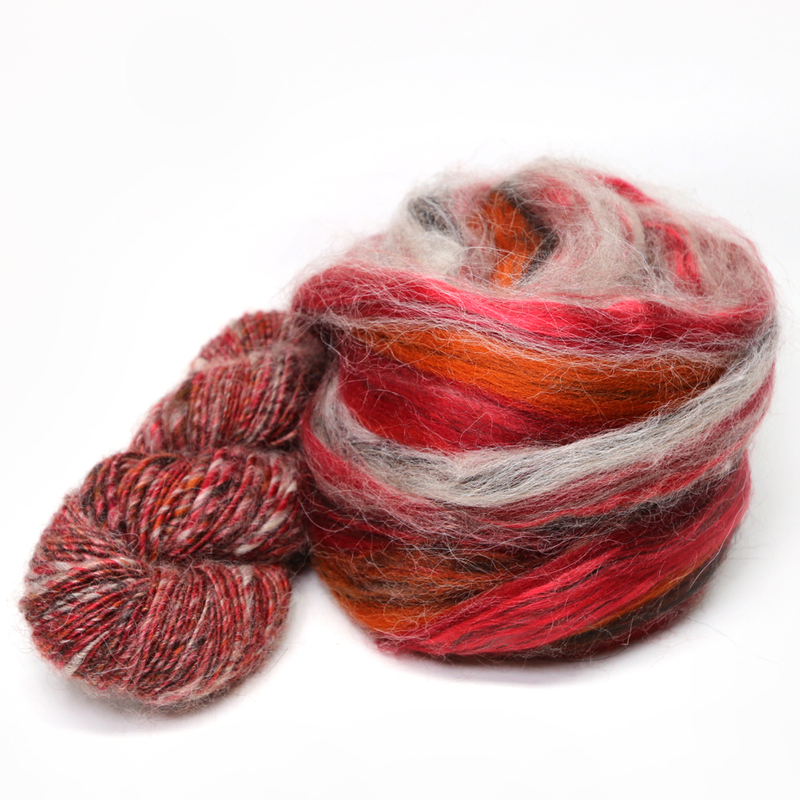 We Spun both blends worsted and woolen. We found that the Golden Lime Blend creates a lovely smooth worsted yarn and the Tawny Port Blend Creates a fuzzy and warm woolen yarn. Both techniques produced equally fantastic yarns. Below is a tutorial to achieve these techniques. How will you spin Tawny Port and Golden Lime? Share in the comment section below. Splitting the top lengthwise to create three thinner rovings. If your fiber has an inclination to be shiny, a worsted draft will make it luminous. Worsted drafting does NOT let twist into the drafting triangle; any air or loft in the fiber is removed. Pinch a small amount of fiber tightly to prevent the twist from entering the drafting triangle. Pull this fiber toward the orifice and slide your fingers back along the freshly made yarn. Pinch again in front of the drafting triangle and continue to repeat this action. PINCH. PULL. SLIDE. REPEAT. Allow NO Twist into the Triangle. Worsted Drafting- Pinch. Pull. Slide. Repeat. If you want a light and fluffy yarn that BLOOMS when finished ultimately achieving it’s loftiest state, a woolen draft is key. Twist enters the fiber before and after drafting like a tornado. This process of allowing the twist into your drafting triangle by means of medium to long draw traps air creating incredible loft. Your fiber hand pulls back while your front hand opens and closes in a pinching motion. This action supplies tension while allowing twist to run into the triangle. When working with blended tops to achieve a woolen yarn, Hand Cards are necessary to open up the fibers introducing more air to create a loftier yarn and create a rolag. 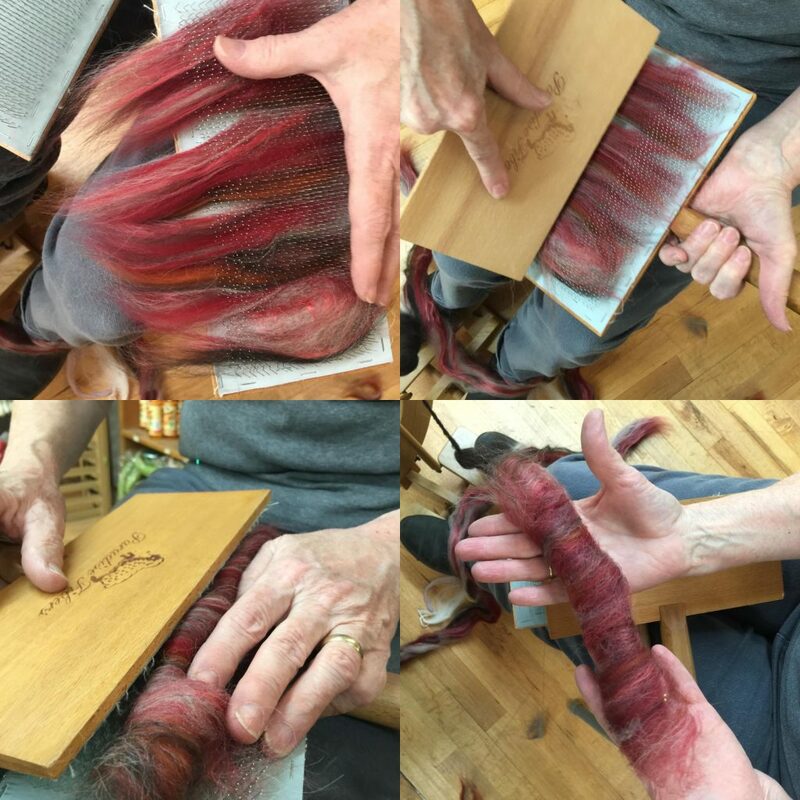 Long draw is a fun way to make your woolen spun yarn. TRUST THE TWIST. TRUST YOUR SPIN. Allow the Twist into the Triangle. Card the fibers from one card to the other – 2 passes – to create a center pull rolag to woolen spin with. Pinch to create tension. Pull Back long draw. Trust the twist and trust your spin. Tawny Port and Golden Lime – 4 oz. Skeins. I now have two 4 oz. skeins in Tawny Port and Golden Lime!! HOORAY! Now, it’s time to measure yardage and of course create something with the yarn. I’m thinking a fall hat or fingerless mitts will show off the yarn nicely. 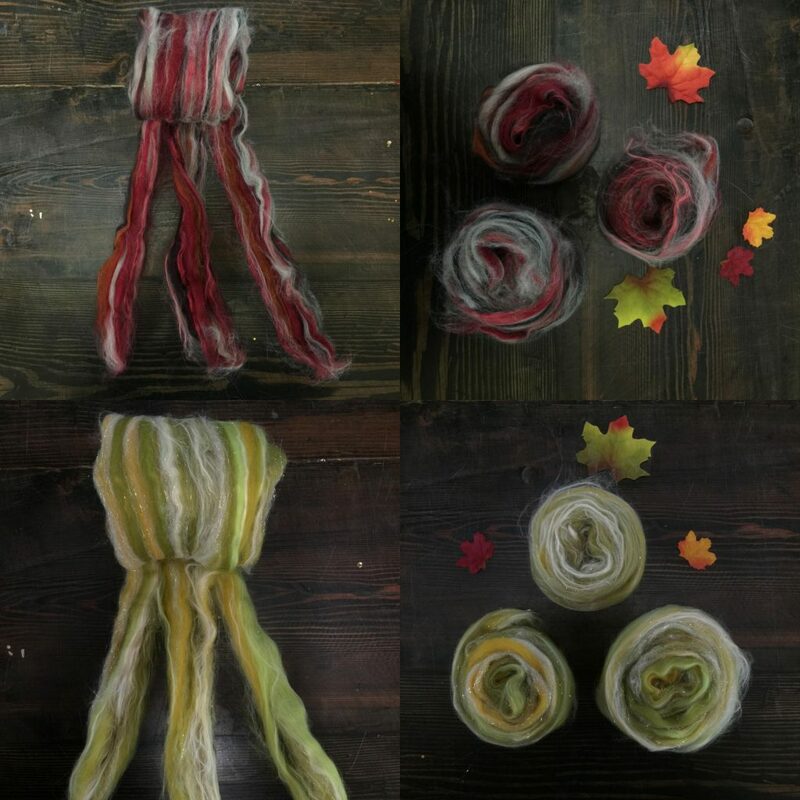 Want to see what others have created with our September Fiber of The Month Club Offerings? 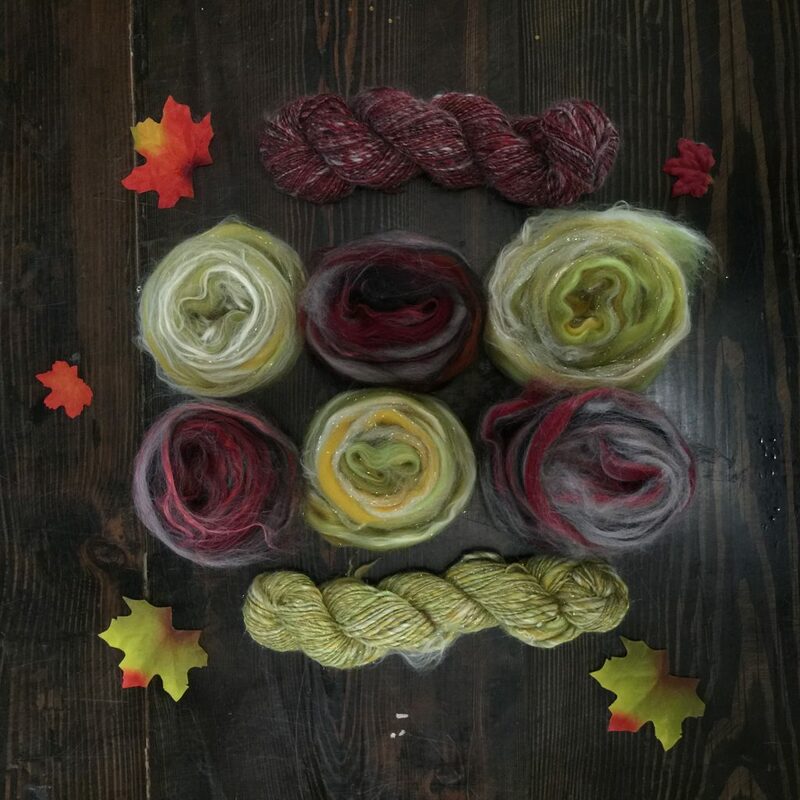 Check out our Ravelry group to see Tawny Port and Golden Lime, as well as previous months offerings, prepared and spun in a variety of ways by our club members! We have some exciting things planned for future Fiber of The Month Club Boxes….Have you enrolled yet? 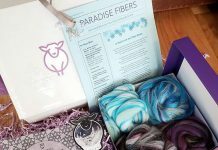 Click here to read all about our Club, Sign up, and see for yourself why we are the best Fiber Club Subscription Box Out there! 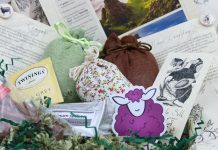 Our Monthly Subscription Box makes a PERFECT gift for a loved one.